Yin metal is medical key password. This is also a “Dating” year and sexually active year. Pregnancy, love affairs, binge drinking and moral misconduct are all relevant this year. 2017 will be an emotional challenge for everyone. This year the lucky number 8 is at the East position, unlucky number 2 is at the North West position and the unlucky number 5 is at the South position. Your bed position is best situated East facing West. The worst positions for your bed are the Northwest and the South. 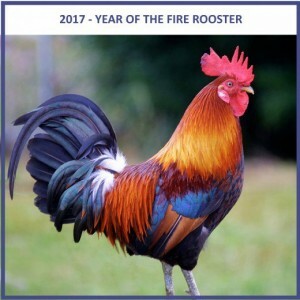 The positive mental attitude of Rooster year is to praise yourself. Give yourself a little gift, a reward, love yourself and believe in yourself. The universe does not exist without you! In 2017 with Trump’s debut, the United States has a lucky number 8 blessing, but only for one year; 2018 in February the United States will have serious challenging for three years. This year the economy of Japan is excellent, because the lucky number 8 is shinning on Japan. But Europe is the land of trouble! Unless there is a miracle. Terrorist attacks have increased this year, natural disasters are many, death has become a habit. This year is the worst year of terrorist attacks. Australia, New Zealand and South Africa this year have trouble. In the face of global disaster or challenge female leaders have to either cope under tremendous pressure or step down in this Year. For Britain Prime Minister Teresa May, she is out of luck and is in a precarious position. There will be quite a few of brilliant young political rising stars this year. This year’s technology and pharmaceutical sectors have good news and new breakthroughs. The last five years of Fire and Earth there are more human lack of affection and more violence and impatience. After 2018 the human pursuit of peace and happiness, we will back to being environmentally friendly and spiritual health; it will be culturally important for everyone to go back to mutual appreciation and love. Spiritual cultural products will be sweeping the globe for the human pursuit of the true purpose of life and the true meaning of peace and happiness.